Steeple is a small village on the Dengie peninsula in Essex. It is situated just east of Maylandsea and Mayland, on the southern side of the River Blackwater estuary. 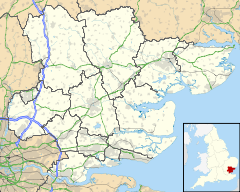 A hamlet, within the village of Steeple, on the banks of the River Blackwater is called Stansgate. The original parish church of St Lawrence was destroyed by fire. The current church was built in the centre of the village in 1884. Stansgate Priory was a Cluniac Priory built near to the banks of the River Blackwater in about 1120. It was one of many priories closed by Cardinal Wolsey in 1534. The village has been home to several generations of the Benn family, who were created Viscounts Stansgate in 1942, since about 1900. They live in Stansgate House. Wikimedia Commons has media related to Steeple, Essex. ^ "Parish population 2011". Retrieved 22 September 2015. ^ a b "Stansgate Priory". Essex Family History. Retrieved 4 January 2015. ^ Will Watkinson (21 March 2014). "One last journey for Tony Benn? Labour MP's wish to be buried in Essex". Maldon Chronicle. Essex Chronicle. Retrieved 4 January 2015. This page was last edited on 5 March 2019, at 00:17 (UTC).